The Ritchey Speedmax Tubeless-Ready Gravel Tire is a go-to choice for cyclocross racers and gravel riders alike. With a remarkable ride quality and low rolling resistance, this all-rounder tire is the perfect choice for all-terrain exploration. Featuring a diamond pattern with low-profile shoulder knobs, the Speedmax provides great traction and mud-shedding capability. 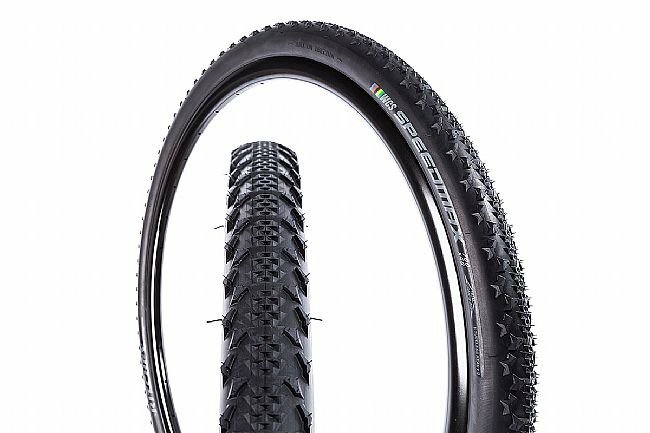 The 120 TPI tire features Ritchey's Stronghold casing for added puncture protection, ensuring that stray gravel, roots, or other irregularities don't end a race prematurely. The Ritchey Speedmax Tubeless-Ready Grave tire is available in one size: 700c x 40mm. Grippy and fast, but don't let them fool you into thinking you are on a mountain bike. Tires performed well for the Grinduro race, though I pushed them past the limit on the single track section. The grip when climbing in dry, loose conditions is definitely better than the Schwable G-1, not quite a smooth-rolling as the G-1, but seem fast enough on the road. Set up tubeless fairly easily on WTB KOM rims. Not cheap but quality feels good.